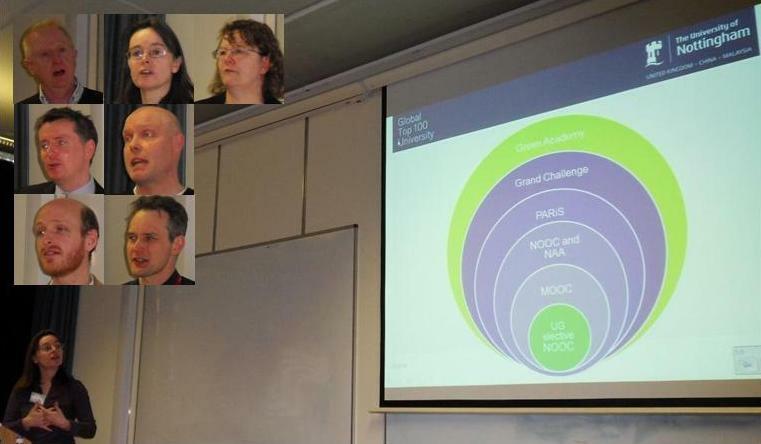 Online learning is a driver for sustainability, said Dr Sarah Speight at a seminar titled ‘Online and open: modelling sustainability and ‘greening the academy’ through E-learning’ at the University of Nottingham on 5 March 2014. Hosted as part of the Workshop and Seminar Series 2013/2014 of the Higher Education Academy (HEA), the seminar aimed to support colleagues engaged in developing courses on Sustainability, face-to-face and blended as well as online. The day started with a welcome and introduction by Terry McAndrew (Academic Lead, Digital Literacy, HEA) and Dr Sarah Speight (academic lead of Nottingham’s Green Academy team). They shared the learning arising from the successful running of the first ‘NOOC’ called ‘Perspectives on Sustainability’, key insights from both development and delivery and the process of translating the internally-facing NOOC into an externally-facing MOOC (Massive Open Online Course) for the Futurelearn platform. Sustainability, Society and You: course website https://www.futurelearn.com/courses/sustainability-society-and-you#!